Morbidelli, which is a woodworking machinery outfit, built a trio of 50cc GP bikes in 1969 for the Italian championship. In 1971 they built their first 125cc GP machine, a twin patterned after the 1966 Suzuki GP. In 1972 and 1973, that machine won a few GPs but the death of driver Parlotti at the TT put the brakes on this. In 1974, Dutchman Joerg Moller was hired to design and build real winners, and he did. In the hands of Paolo Pileri and Pier-Paolo Bianchi, these 125cc twins won 3 world championship in succession, while a larger 250cc won the 1977 title in the hands of Mario Lega. In 1977, Jorg Moller was fired and joined MBA-Benelli Armi, now at political war with Morbidelli. Morbidelli then built a 4-cylinder 500cc that raced until 1982, when Morbidelli quit racing due to economic pressure. I was hired in 1977 to provide technical suggestions to improve the motorcycles. 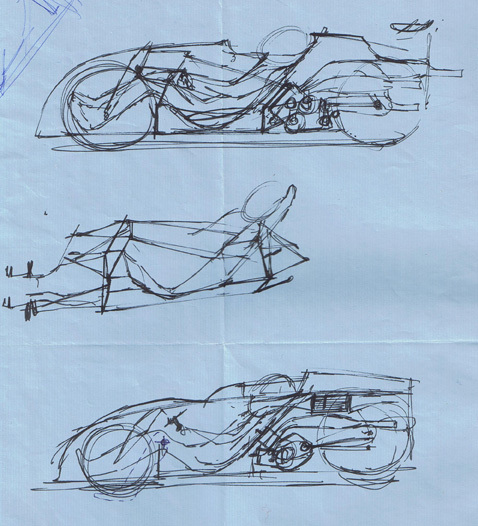 The decision by Giancarlo Morbidelli was based on previous work I had begun in 1968, sketching motorcycle concepts derived from the Ray Amm 1953 Norton kneeler. This first pencil drawing is dated from June of 1968, at a time when the Bell Star helmet was unknown in Europe. My inspiration was... astronaut helmets! The bike is aerodynamically all wrong and would have caused massive lift, but the seat is virtually identical to the ones first used by Don Vesco at Daytona in 1972. Also interesting is the use of brightly-colored leathers, at a time when virtually all racers used black Lewis leathers. The design of this motorcycle was inspired by Ray Amm's 1952 Norton record bike for the position (kneeling rather than seated) but used a center-hub steering with a front swing arm, a solution later picked by Andre De Cortanze for the Elf-X motorcycle in 1978. De Cortanze was the designer of the Team Pescarolo Courage-C60 and also of the 1998-1999 Toyota GP-C, the Peugeot 905 LM of the ‘90s. 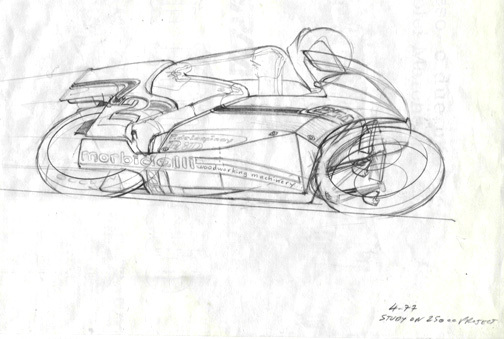 This design also featured an aluminum monocoque chassis/fairing/fuel tank. The exhaust is routed under a formed resting pad under the driver's chest. Also note the cast wheels at a time when there were only wire wheels available for motorcycles. This exact wheel design was later used by Yamaha beginning in 1975. This design led to the following and more elaborate artwork devised in 1973. 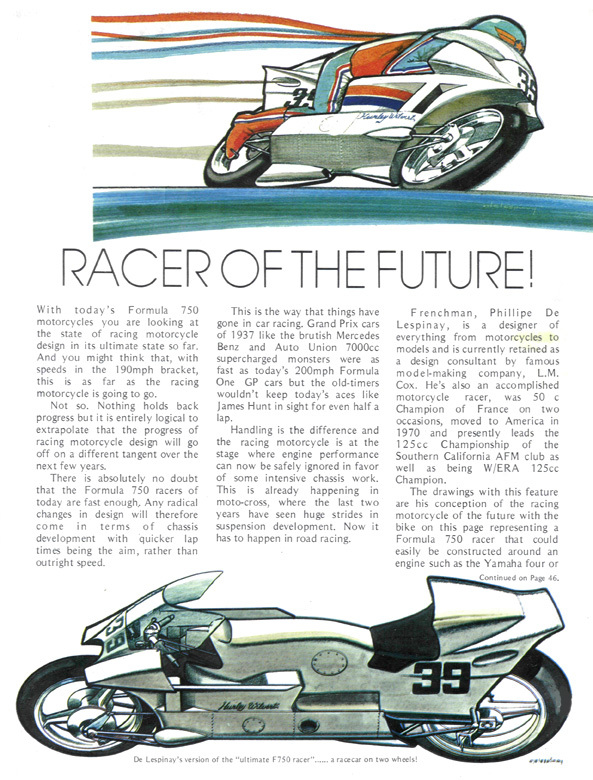 Originally produced for the program of the US Grand Prix (Motocross) in Carlsbad, CA in 1974, it was later re-printed in the Yamaha International Magazine in 1975. 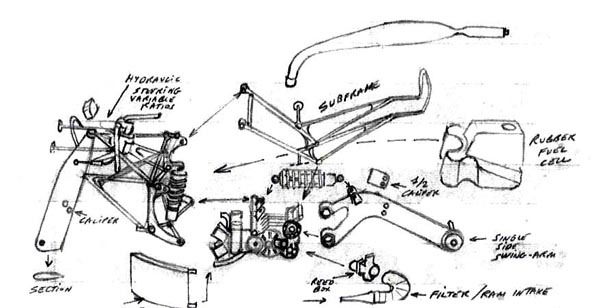 It precedes the actual re-introduction of the mono-shock rear suspension by Yamaha (1975) and shows many features that were quite advanced at the time, such as advanced aero and inboard disc brakes, not counting the bell-crank rear suspension that was later adopted by Kawasaki and ultimately most other motorcycle manufacturers. Note the fixed idea with the kneeling position, better aero that actually provides down force instead of lift, but generally the same basic thinking, just more detailed. A Kawasaki 250cc design similar to what was later used for Kork Ballington to win the 1978 World Championship, though that bike used an inline twin configuration to reduce width. 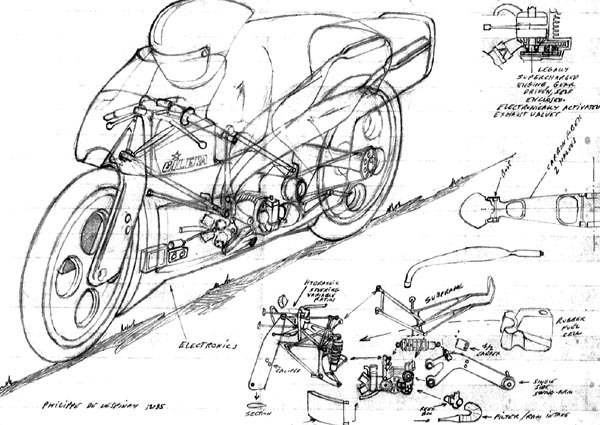 These drawings were shown to the Kawasaki R&D management at their request. They had a good look, since some of the solutions were later seen on their world beater. 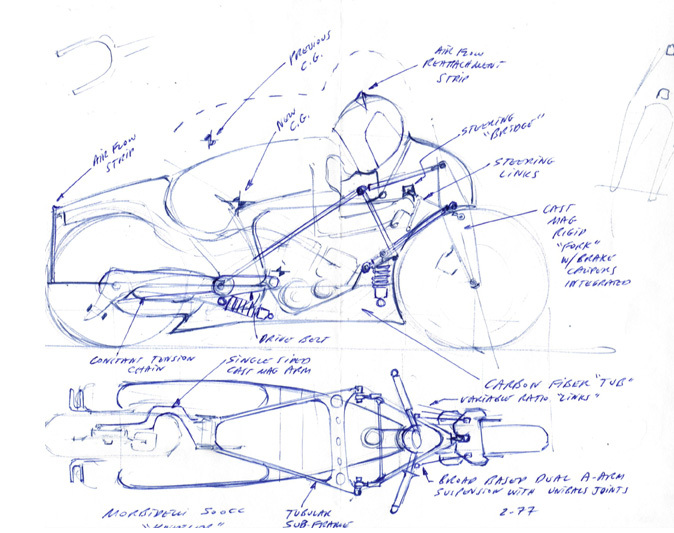 During a 1978 visit in Pesaro, I was hired by Giancarlo Morbidelli to design and build a new 250cc motorcycle. The works bikes had serious handling deficiencies and could not put their 72HP down to the ground satisfactorily. They had tested several frames from Nikko Baker and Bimota, but none was any better than the original unit. Morbidelli wanted to explore entirely new directions and entrusted me with the job of designing and building something completely different. With modest means and the help of my friends at All American Racers in Santa Ana as well as Hurley Wilvert, we built an interesting and very effective racer, using a set of Yamaha crankcases as a basis for a 6-speed, water-cooled engine, fitted in a highly modified Steve Machin frame. I built the frame from an original Steve Machin job bought from British journalist John Weed. There was not much left of the frame after I was done with it. I think that I was one of the first to angle the shocks for greater travel, like Suzuki did later on their 750's. I modified them with a long alloy tower so as to get them to fit. I raised the engine position in the frame and placed it another 2" back from where it was, then redesigned the whole fairing and foot-pegs stays. I made my own cylinder block on top of a reinforced AS1 crankcase purchased in a junkyard for 10 bucks, with the crank bearings screwed in place (they had a tendency to rotate inside the cases). I modified the 5-speed cluster into a six-speed, using some existing Yamaha gears, narrowing them to fit, and a revision of the shifting drum. I seriously revised the wet clutch design and mounted it on needle bearings. Later I used a dry clutch made in France but it did not work as well. I machined my own water pump driven by the former oil pump plastic gear, and used a discarded Kawasaki radiator as well as other discarded parts coming from the Kawasaki R&D thrash bin in Santa Ana, California, to build this bike. It included a Harley 250cc seat that I cut, shortened and narrowed, as well as other small bits. I made the fairing from a discarded Yamaha 250 unit, cut down, narrowed, shortened, and fitted with a "bubble" on the right side to contain the water pump. Hence the name of the bike, the "Garbage Can Special" or GCS. I built the tuned exhaust, made new pistons from Hepolite forgings and used plain cast-iron liners, ported by my good friend Hurley Wilvert who was a driver for Team Hansen Kawasaki. We used an extra "boost port" and holes in the piston to obtain a greater charge. The ignition was standard Yamaha TZ250, the tack by Kroeber. All used bits and pieces purchased or donated by racing buddies. The front disc brake was made of uncoated aluminum discs and Honda 500cc calipers. I retained the AS1 rear wheel but fitted alloy D.I.D. wider rims for the special K81 "soft compound" Dunlop tires supplied free of charge by Joe Hunt, the Dunlop Racing distributor then. The tank was an alloy job from Steve Machin, modified with an aircraft flush cap and various other mods. We put the engine on a Froude dyno and read 31HP, a substantial increase over the TA125 I previously raced, that did not handle well, had poor braking and very suspect reliability. Took me 3 races to sort it out, then it won just about every race in south and north California that it entered. Completely obliterated the other 125's there, TA125's, Honda MT125's, Bultaco TSS's, even the Villa-Montesa's. It just won and won and won until I obtained the drive on the works Morbidelli in 1978. When Dr. Giancarlo Morbidelli saw the pictures in the Yamaha International Magazine, I was hired on the spot to design and build a new motorcycle to help them try to win the 1978 250cc World Championship. Hurley Wilvert, a talented racer who finished 3rd in the 1973 Daytona 200, helped me build this technically and aerodynamically advanced 250cc for Graziano Rossi. The first thing I did was to redesign the fairing and seat to eliminate lift and re-route the airflow through the motorcycle, which I identified as a serious problem. There we gained a large amount of top speed plus some cornering down force. This resulted in a splendid win by Pileri at Spa where he destroyed the works Aermacchi -Harleys and Yamahas, leaving them in the dust of over a minute and a half by the end of the race. Evolutions of this design lasted until the very end of the racing program at Morbidelli and were also used on the 350 and 500cc bikes quite successfully. We also tested for the first time and in secret, helmet spoilers to reduce helmet lift. It would take nearly 12 more years for anyone to actually put them on a production helmet. Here, Mario Lega drives the new aero parts I designed and built, fitted on the 1977 bike. It was so much faster than the works Yamahas and Harleys in a straight line with these parts that Paolo Pileri won the super-fast Belgian Grand Prix at Spa at record speed, a minute and a half on front of Walter Villa (Harley) and Franco Uncini (Yamaha). The 1977 works team: Paolo Pileri and Mario Lega pose on front of the 250cc and 350cc machines, now fitted with the new seats (bikes at left and right) and the new fairings (bikes in center of the picture). These motorcycles no longer bear the "Morbidelli-Benelli Armi" badges as this picture was taken after the messy divorce. As soon as I was In Pesaro, I had conversations with then 250cc world champion Mario Lega and Paolo Pileri, the former 125cc world champ, about what their bikes were doing and what kind of handling or problems did they have with them. I came back to the states and with the technical help of Hurley Wilvert we designed and built a very unconventional machine. It used a modified Earles front end with built-in anti-dive system by geometry and not hydraulics as used by the Japanese companies. The fuel tank was relocated low, on front of the engine, with a small electric pump feeding a catch tank and the carburetors by gravity. The rear-facing exhausts were routed under the seat. The engine weight was transferred as close to the rear tire as possible to increase traction and there was a formed glass fiber structure for the driver to rest over. The water radiator was located in the nose, feeding the cylinders through small diameter hoses. The new bike had a triangulated framework of 1" tubing and there was no conventional steering column. Instead, Rose joints were fitted as on a racing car. Many of the parts were fabricated by Dave Klym of FabCar and by Hurley Wilvert at... the R&D department of Kawasaki USA, after-hours and in secret of course! 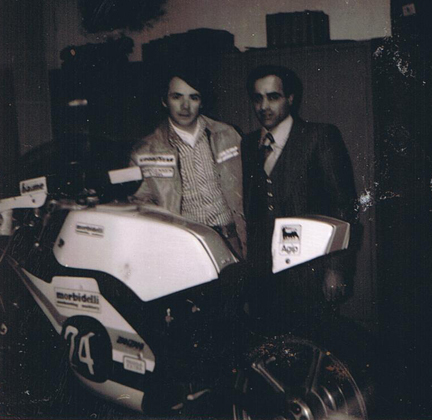 The late Paolo Pileri and me in a candid picture taken at the Morbidelli racing shop in early 1978. The bike is the 250cc Morbidelli with which Mario Lega won the world championship in 1977. Interestingly, I was wearing a true collector item that day: a Jorgensen-Eagle jacket, produced in very small quantities for the team members at the occasion of the 1975 Indy 500 win by the All American Racers Eagle team, of which I was an enthusiastic supporter. I still retained it in near perfect condition to this day. The new bike was assembled in Pesaro in the winter of 1978 and was tested by Valentino Rossi's father Graziano. It was fast and did exactly what it was supposed to do, not diving under braking and applying excellent traction and down force when leaned into corners. But the front end lacked mechanical rigidity and twitched under braking. I had other obligations and could not stay there any longer, so I designed a reinforcing brace and left. From what I gather, there was an internal dispute between Mr. Morbidelli and Rossi on one side, and the crew on the other. The crew was claiming that the problem was not a question of rigidity of the front brace but of the whole concept, while Graziano felt that he liked what he saw and wanted to pursue the experiment in the direction I had pointed. In the meantime, the works had loaned me a motorcycle and I used it with good effect, winning a string of races on the Southern California tracks. I was immediately unhappy with the italian shock absorbers and we fitted lay-down US-built S&W units. The bike immediately handled better with much more rear suspension travel. While it raised the back a bit, it also negated some of the lift caused by the fairing design, allowing a faster curve speed without having the front end washing out. it proved utterly reliable and we ran two seasons with almost zero maintenance. At the end of the second season, we opened the engine to find out that the only problem was that of the clutch shaft bearing had spun in the Ferrari-cast engine cases. 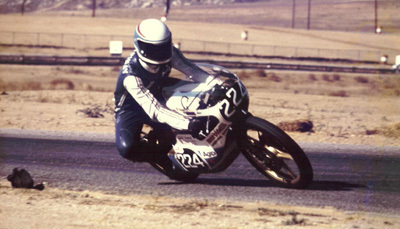 The motorcycle is seen here in the famous Turn 7 at Riverside Raceway in 1978. Meanwhile and as already, several top-level personnel had defected to MBA, Dr. Morbidelli gave to the demands of the remaining technicians and they built a new frame inspired by the new concept but built with a conventional steering column and a telescopic fork. Also discarded was the low fuel tank. Rossi did quite well with the bike and fought a tough battle with Kork Ballington and the works Kawasaki all year, but too many falls and mechanical failures meant that Kawasaki won the championship. At the end of the year and wanting to concentrate on the new 4-cylinder 500cc, Morbidelli sold the 250cc and 350cc program and all the spares to the Italian "Ad Majora" team. They did not do too well with the bikes, unable to really understand the complex Jorg Muller-designed engines, encountering lots of mechanical failure, let alone get to speed. Eventually, Giancarlo bought the bikes back and restored them for his museum, now located in the old woodworking machinery plant. While in Pesaro, I had long hours of discussions with Dr. Morbidelli (and a translator) and I did lots of sketches to express theories that we should try. This is a very interesting sketch, showing down force-generating aero on the driver's helmet for the first time. The date is 1977 and this was done while working as a consultant for Morbidelli, then the dominant 125 and 250cc force in the Grand Prix world. The bike's design shows a very evolved aero system including an downward-facing routing for the air going through the nose-mounted water radiator. It took until 1992 for a helmet manufacturer (Bell) to at last address the problem of lift on a helmet. Today, every manufacturer has some form of device to reduce aerodynamic lift on their helmets. Also dated 1977 is this sketch with annotations made on a restaurant napkin in Pesaro, Italy, during an intense conversation with Dr Giancarlo Morbidelli. The previously expressed general ideas are retained, but check this out: the front suspension is now a wide double A-arm system with a profiled cast-magnesium rigid fork incorporating cast-in brake calipers, the system adjustable for camber as well as trail and using a sophisticated inboard Koni shock. There is adjustable-ratio steering controlled by rods and Heim joints. Power is fed to the rear swing-arm axle by a constant-tension chain, a second constant-tension chain driving the wheel over a single-side arm. There is virtually no frame to speak of as the composite glass-fiber and Kevlar fuel tank acted as a stressed member. The steering "bridge" was held by a few small pieces of tubing bolted to the composite "tub". Carbon fiber had not as yet found its way onto a racing car but I remembered the Chaparral 2 composite tub and was impressed by its rigidity and light weight. Unfortunately, it was not to be as other priorities loomed, and I could not abandon my life in California. Regardless, no regrets as I met some brilliant and open minded people . Today, Graziano's son Valentino is cleaning up in MotoGP, showing to be a new genius in driving and tactics, possibly the most talented motorcycle racer ever. Many years later, I met Giancarlo Morbidelli again, this time during a visit in California. We had lunch in an Italian restaurant in Tustin owned by vitamin king Richard Marconi, and there, drew a project for a new motorcycle for Gilera. 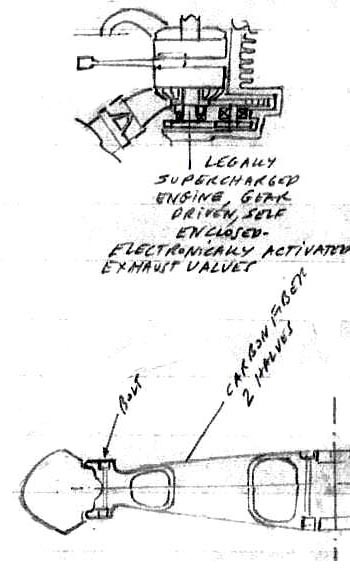 This was a pretty advanced idea of placing the 500cc-4 engine behind the now laid-down driver, lowering the entire motorcycle with rider by a solid 3 feet! If any of you has any doubt that this could ever work, please have a look a TWO examples: the Gurney Alligator and the Honda "lay-down" scooter. Both are possibly the finest handling bikes I have ever driven, with the most secure cornering attitude I have ever experienced. Unfortunately the FIM would not hear of it and rejected the whole idea when they were contacted for inquiring about the legality of racing such a machine... There is also now a Swiss-built, BMW powered fully enclosed motorcycle following these lines and that has proven immensely successful, being at the same time very fast (aerodynamics) and handling beautifully and very safely. 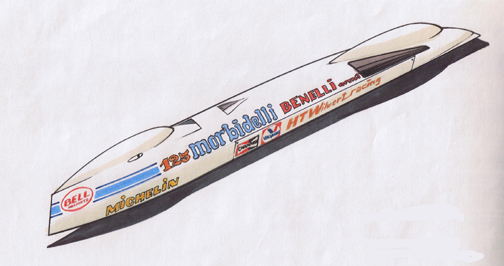 A project that never materialized was the idea of using an alcohol-fueled 125cc GP engine in a streamliner so as to establish new class speed records at the Bonneville Salt Flats in Utah. The idea was to attempt to reach 300kph, a goal attainable on paper with the approximately 60HP available on a mix of methanol and nitro-methane. The financing would come from Valvoline, Champion, Bell and Michelin, all interested in the project. 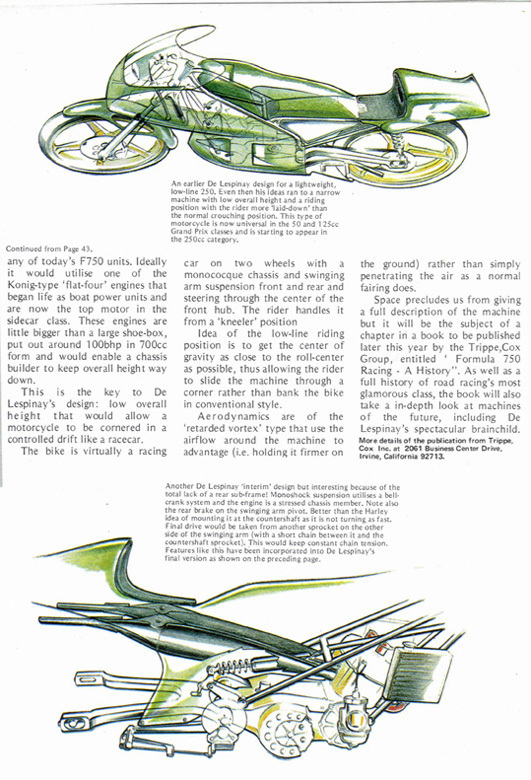 The first idea on paper was a low frontal-area lay-down bike similar to the 1963 Kreidler-MEO of Rudolf Kunz. The driver would lay down face forward, the engine located at the rear and driving the rear wheel through a toothed belt. Quickly, a decision was made to have the driver resting on his back as it was felt that he could better control the vehicle. A simple monocoque structure was devised, only 1" thick. It was made of two 24-gauge alloy skins and sandwiched balsa wood bonded with epoxy. The front and rear bulkheads were riveted and glued at each end. The front unit supported the front suspension and hydraulic steering. The rear bulkhead supported a small tubular structure with engine, swing-arm, fuel tank and ancillaries. The outer skin was made of Kevlar-reinforced ultra-thin Fiberglass. A full-size mockup was built with plywood to check on ergonomics and was found to be satisfactory, if cramped. Forward vision was decent despite the large wheel fairing. One could operate the steering, throttle and brake with little trouble. A 1/4 scale model was constructed and tested at the Cal-Tech wind tunnel. But this is as far as it got. Two many other projects, too much pressure to succeed in the grand Prix world and this project was shelved. The sole surviving (and damaged) picture of the wind tunnel model in 1/4 scale of the final version with the driver laying on its back. the wind-tunnel tested CD was .016 with 45lbs of lift, quite a good result. Giancarlo began discussing a friend who had become the boss at Gilera. They were interested in coming back to racing with a 125cc world beater and were looking for ideas. So we designed a project bike for them on the spot!. I retained the original drawing made of the machine. It was full of advanced ideas including a "legal" compressor turning at 2.5 times the engine speed, as well as a front double A-arm front suspension. I know that at least some of the features did find their place in the Gilera motorcycle that eventually beat the Hondas in 2001. The basic design was one of extreme aerodynamic benefit. 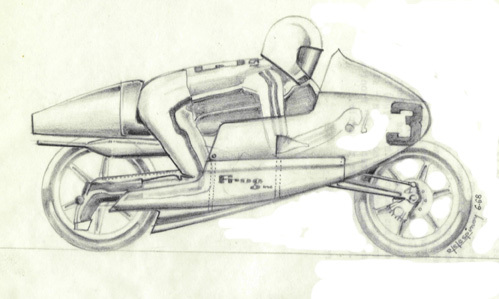 Note that the pre-war styled "record-setting" helmet has found its way in the later "hunchback" leathers several years after this was drawn, actually a more practical way of achieving the same result. The front upright (there is no "fork" to speak of) is a one-piece streamlined cast-magnesium part that also includes the front brake calipers. The wheels are also streamlined but allow for clean passage of side winds. There is no added brake disc, the wheel rim, made of two pieces of carbon fiber bolted together also acting as the brake rotor. There is virtually no frame as you can see in the drawing below. The engine IS the chassis and bolts directly to the front and rear suspension units. The engine drives the rear wheel through a constant-tension chain as the drive gear is running through the center of the one-sided swing arm. The front suspension is by dual and shoulder-wide wishbones, and a single shock is actuating the adjustable system through a small bell crank, the whole structure bolted onto a fabricated sheet steel or aluminum bracket. The steering is hydraulic with adjustable ratio so as to allow the driver large amounts of movement without upsetting the basic stance while cornering, allowing much finer control at the limit. The engine is quite interesting and borderline legal: it is a single cylinder, 2-stroke unit with a single reed valve intake feeding a gear-driven turbine that compresses air and fuel to about 2.5 times the crankshaft speed (see schematic on picture # 3). There is no conventional exhaust port but no less than 4 electronically controlled segmented exhaust valves leading to a pair of expansion chamber located on top of the horizontal cylinder. This allows the piston to run freely without the single ring "hitting" a conventional exhaust port. The front suspension-supporting unit is made of two pieces of stamped sheet steel or aluminum. They are bolted on top of the engine's crankcase at their bottom edge, and to a small tubular sub-frame working in tension and supporting the driver's seat and composite driver's support structure, anatomically designed to receive the torso, arms and chin comfortably. It means that the entire front suspension unit can be unbolted from the engine within minutes for an eventual replacement unit with different settings. The cast-magnesium single-sided swing arm is bolted directly onto the carbon fiber engine case. This being a one-piece molding with external covers from which one may slide the crankshaft and a cassette gearbox with an integrated clutch system incorporating a torque converter. The swing arm axle rotates at drive-gear speed inside engine-oil lubricated sealed bearings. As with the front upright, it includes a brake caliper acting on a "disk" molded into the carbon fiber rear wheel rim. The single shock/spring unit is simply attached to the engine crankcase. Over 80% of the torsion and longitudinal efforts is carried by the carbon fiber crankcase just like on an F1 gearbox. Indeed, BAR now has a carbon gearbox doing exactly the same job, and quite successfully at that! This swing-arm assembly design allows the chain to be in constant tension, giving much more precise transmission especially under downshifts. The pressurized rubber fuel cell fits inside the front suspension system and feeds the single 38mm indirect fuel injection throttle body. Two surface coolers are part of the outer fairing to keep the engine bay enclosed and by thus, less subject to aerodynamic drag. The filtered air is pressurized by a small ram air intake. Whatever was retained of these ideas by Gilera's engineers, in 2001, Manuel Poggioli won the world championship on the new motorcycle. There is now a new book out about the Morbidelli saga, written by an Italian journalist by the name of Claudio Porrozzi. It is a major re-writing of another book penned in 1982 after Morbidelli abandoned racing. I am honored that both times, Mr. Morbidelli insisted that my picture as well as some of the work I did for the company be featured in both books. More information of Morbidelli motorcycles follows. Giancarlo Morbidelli began collecting old motorcycles as early as 1967. One of his favorites are the Pesaro-built Benelli bikes. The Benelli brothers had also a small manufacturing of light arms for the Italian army and police. In 1975, as the 125cc Morbidelli began to erase the Japanese Yamaha from the top placing in the world championship, the owners of Benelli Armi approached Giancarlo for the purpose of manufacturing under license a 50cc machine of which the design would be done by Jorg Moller. This led to an agreement and the creation of a company called Morbidelli-Benelli-Armi, and production began in 1976. While very few 50cc machines were produced, a larger number (about 50) of the 125cc machines were made available to wealthy privateers. The bike was similar (but not identical) to the works bikes, except for the cylinder and exhaust design that used 3 instead of 5 transfer ports. The result was that the works bikes had a 7HP advantage over the production machines. At the end of 1976, things got a bit edgy. Apparently, Jorg Moller and Pier-Paolo Bianchi had a relationship that exceeded that of their obligations on the racing track, and Giancarlo Morbidelli, a conservative person, saw this in a very bad way and fired both on the spot! Bianchi and Moller departed as well as technician Dionigi to... Benelli Armi. Dionigi also took with him the power secrets of the 125 and 250cc engines as well as the listing of suppliers. This started a rift where all relations with Benelli Armi where severed, and the Morbidelli works bikes went back to be called simply... Morbidelli. The details of this unsavory events were kept under wrap by Mr. Morbidelli for quite a while. The Benelli-Armi machines were immediately re-christened "MBA" and evolved in 1978 with a new mono-shock rear-suspension version as well as a new 250cc bike of which the engine was a virtual copy of the 1977 Morbidelli. 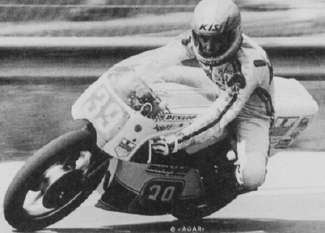 But while the 125cc had things pretty well to its own since Morbidelli had retired from the class, the 250cc was not even up to the standard of the older Morbidelli and not until 1982 did it become competitive. Eventually a few years later, the whole MBA company collapsed in terminal financial troubles. Giancarlo Morbidelli had his revenge and at the bankruptcy sale, purchased good examples of the 125 and 250 production bikes for his own museum. The earlier 1973 350cc engine was not at all like the later square-4 500cc. It was a flat-4 engine facing the road, with a pair of disc valves on top of the engine, each feeding a pair of cylinders. The engine was mounted in a rather voluminous frame and clothed with a large fairing reminiscent of that of an H1R Kawasaki from 1969. The machine never worked well and was abandoned as Moller was hired to develop a new 125cc that led to new parallel twins in the 250cc and 350cc classes. The machine and unfinished spare engine is now on display at the new museum located in the former woodworking machinery plant at 33 Via Fermo in Pesaro, as well as the machine loaned to me for US racing, still wearing its lay-down shock system worked out by Hurley Wilvert. Enzo Ferrari and Giancarlo Morbidelli were very good friends. Indeed, the crankcases of most of the Morbidelli racing engines were cast by... Ferrari, as a gesture between friends. There is also talent in Giancarlo's son: who is to forget that when Alain Prost refused to get in the F1 car at the Australian GP because of the awful weather conditions, Gianni Morbidelli was asked to take over the car and promptly finished second to Senna in the torrential rain. Just before the end of the F2 series in 1984, Ferrari and Morbidelli were working on a very secret project: a reed-valve, fuel injected 2-stroke V6 Formula 2 engine. At that time, the best F2, 2-liter 4-stroke engines were cranking about 325HP. Morbidelli built a 2-liter V6 that could easily and lazily develop 400HP, only 200BHP per liter when the best 2-stroke engines could do 300BHP/liter for similar single-cylinder displacement. The thing was built but before it could even be started, the FIA killed the F2 and replaced it by F3000. Think of the giant killer it could have been: the engine weighed only 1/2 of a conventional 4-stroke job, had a potential of at least 75 more caballos and fuel consumption was only 25% more, requiring carrying a bit more fuel but nowhere near as much as to negate the advantage. The engine is also on display at the Morbidelli Museum. Morbidelli also has tons of great ideas such as segment-valve designs, camshaft-less engines and tons of very creative ideas that COULD be made to work, and better than what we are accustomed. As a self-made millionaire, here is a guy who really earned it by having an open mind.